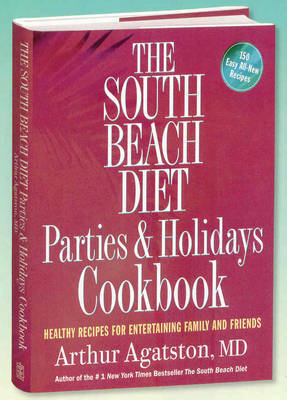 The South Beach Diet Parties & Holidays Cookbook: Healthy Recipes for Entertaining Family and Friends by Arthur Agatston M.D. from The South Beach Diet Parties & Holidays Cookbook: Healthy Recipes for Entertaining Family and Friends The South Beach Diet Parties & Holidays Cookbook by Arthur Agatston M.D. Grilled shrimp on rosemary "skewers"
Accompaniments: Turkey and watercress tea sandwiches; Grilled shrimp on rosemary "skewers"
With more than 19 million copies in print worldwide, the best-selling phenomenon continues with fabulous all new recipes for healthy, delicious South Beach Diet-friendly entertaining. The famed Miami Beach cardiologist who has helped millions of people worldwide to lose weight and eat healthier with his best-selling South Beach Diet books now addresses the special challenge that can undermine anyone's willpower - the irresistible lure of diet-busting dishes at festive occasions.